Peace Tree Farms in Kintnersville Pennsylvania is a rare place. 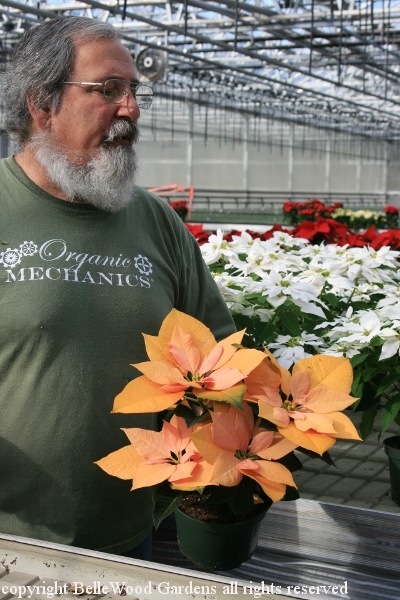 Wholesale only, plants for garden geeks, and certified organic greenhouses (which is just about unheard of.) So when Lloyd Traven graciously said he'd allow members of the Tohickon Garden Club to make a visit, that he'd show us around, and yes, we could also purchase plants you can be assured that I was among the delighted visitors. The nursery doesn't grow Wave petunias or the sort of annuals you could expect to find at the big box stores. They are constantly on the lookout for something new, different, exciting - the kind of plant where visitors to your garden gasp in amazement and with honest horticultural envy ask, "Where did you get that?" 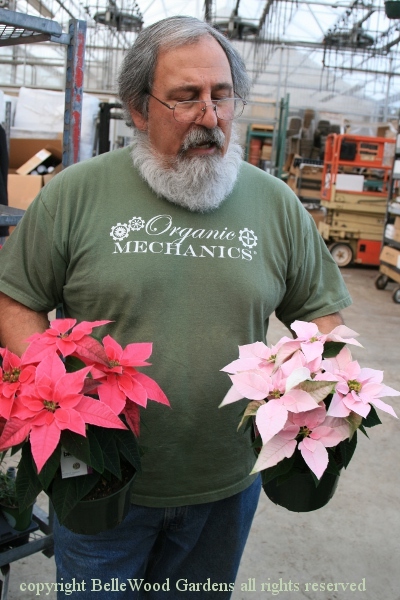 They are producing thousands of plants for exhibitors at the upcoming Philadelphia Flower Show next March. 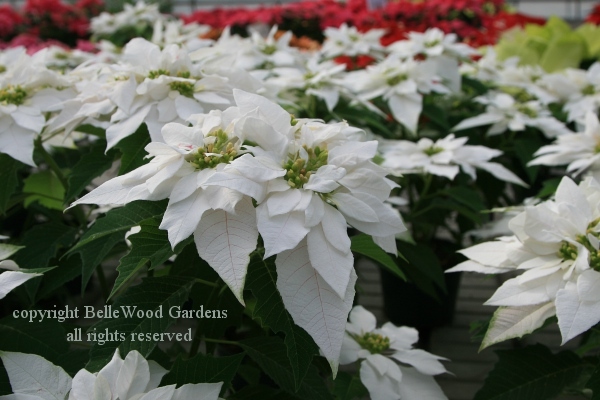 And they did grow wonderful poinsettias for their wholesale customers, rapidly shuttling out the doors at this time of year. 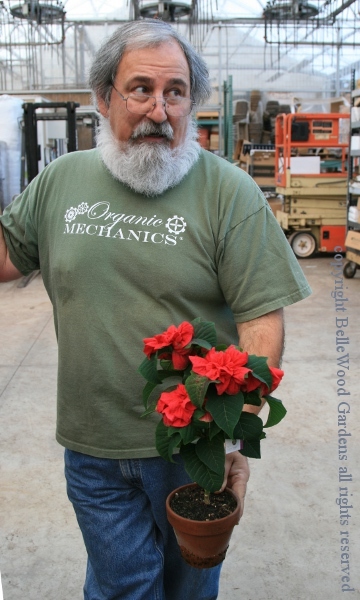 That's Lloyd, not Father Christmas, perusing a couple of poinsettias he's about to tell us about. Let me back up and tell you a bit about poinsettias. Native to Mexico where it is called it is called Flor de Noche Buena, Euphorbia pulcherrima is a rangy plant reaching anywhere between 2 and 13 feet tall. It was introduced to the United States by Joel Roberts Poinsett, the first United States Minister to Mexico. By 1836 it had become known as poinsettia. Due to its scraggly growth and habit of dropping its lower leaves, poinsettias were often displayed in umbrella stands which not only helped hold them upright but also disguised their naked stems. 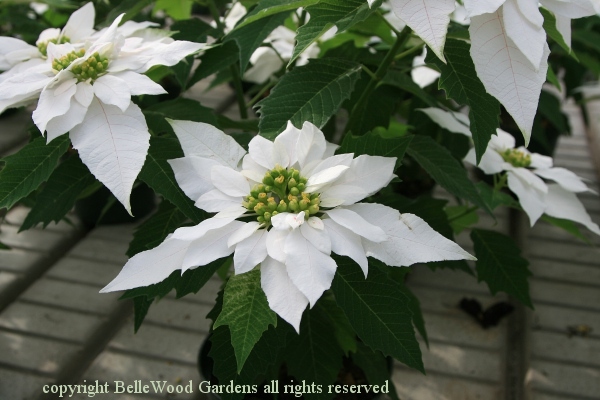 December 12th is Poinsettia Day, so designated because it also marks the death of Joel Roberts Poinsett in 1851. Poinsettias are the best selling potted plant in the United States and Canada and generally sold as a Christmas plant within a six-week period that leads up to the holiday itself. 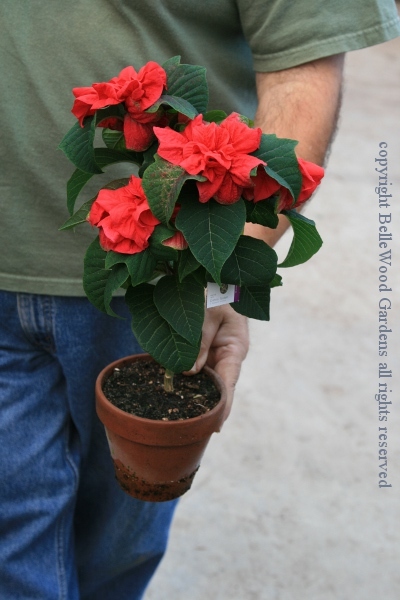 According to the USDA, the potted poinsettia crop for 2012 was valued at $144 million. 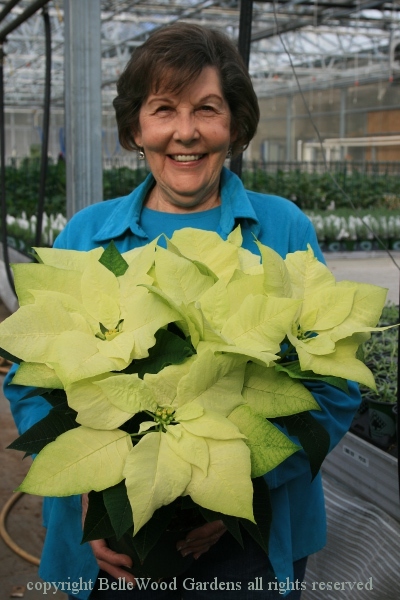 Peace Tree Farms is always looking for something new and different to do with their poinsettias. Such as a standard (single stem form) of 'Christmas Rose', a smaller flowered, double bracted cultivar. Suitable, Lloyd suggests to us, as a holiday gift for schoolteachers, something they could keep on their desks. Remember I said that Peace Tree Farms is certified organic? Lloyd showed us the little packets of beneficial insects, stapled to popsicle sticks and stuck in pots. He also explained about the pots of Verbascum thapsus here and there on the benches. 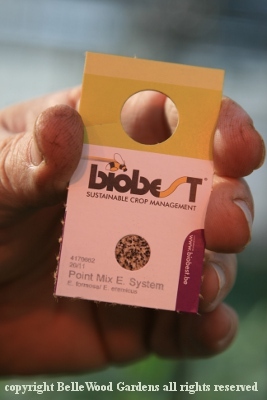 They're also part of the IPM, sustaining other beneficial insects. 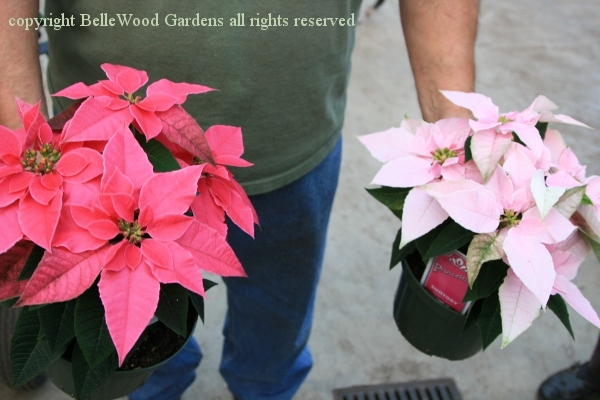 Poinsettias got their start as Christmas plants, no doubt thanks to their vivid, festive, holiday red bracts. Various pinks have been around for a while. There are also soft ivory and cream. Here, I saw a bench of the cleanest pure white. I'm not sure, but think it might be 'Princettia' from Suntory, a Japanese company. Lovely. This soft apricot orange is 'Autumn Leaves'. There are several other cultivars in the same color range. Beautiful color, but not sure if it says "Christmas." This is the one I really want. How would you describe it - lemon frost maybe? It's not really chartreuse but it's a warm shade. I liked them all but this is the one I really craved. Can't have it. It's being trialed for next year. And when he's done with them Lloyd is obligated to trash the plants. So sad. I'll just have to come back. But I'm not going home empty handed. Heavens, Lloyd might think I didn't like his plants! No, two fancy leaf begonias and a pretty pilea with pink and white new growth have been welcomed to BelleWood Gardens.